As a part Italian film buff, I grew up with the family tradition of watching The Godfather trilogy nearly every single year. To my family, it’s not a film about the mafia; it’s a film about family that uses the mafia as a Shakespearean and operatic backdrop. Of course, this is the most apparent in the often berated Godfather III, which culminates at an opera house. However, structurally it had been building steadily since the opening of the first scene of I with the words of Enzo the Baker as he states, “I believe in America,” before asking Don Vito Corleone (Marlon Brando) for help. Easily my favorite series of all time and miles above the love most in my generation feel for Lucas’ epic Star Wars series-- I’ve not only seen the films more times than I’d care to admit but I’ve also seen them in every single version offered aside from theatrically. First as a young film geek, I eagerly explored the videotapes, eventually catching the series whenever it was on television (which never failed to disappoint in its editing both for “content”and also “running time”) until getting my hands on the beautifully packaged two video-boxed sets that were released from Paramount in the late 90’s until their first box set release on DVD in the early 2000’s. Now Paramount's epic series is back with another set-- a Coppola Restoration no less and one that contains five discs. Needless to say, I wondered if the upgrade was necessary, for as an indebted graduate student-- frankly I have yet to get with the Blu-ray program since the players and discs remain well over my budget. Would I witness enough of an impact without a Blu-ray player? Surprisingly, yes as I was more than impressed with the standard DVD set upgrade alone. Supervised by the master filmmaker Francis Ford Coppola and his legendary cinematographer Gordon Willis (nicknamed “the prince of darkness” for his ability to shoot such barely lit scenes to master the film’s ominous tone), Film Preserve employee Robert A. Harris worked alongside the men for the painstaking frame-by-frame and state-of-the-art, digital restoration of both Best Picture winners, The Godfather and The Godfather Part II. Having already completed stellar restoration of Hitchcock’s classics Vertigo and Rear Window, Harris was the best and most capably gifted choice and having Coppola and Willis so intimately involved was the ultimate luxury as when it came time to toy with the sound and color of the works from the Master of Suspense, Harris didn’t have the fortune of turning around to ask if he’d gotten the intent precisely the way the filmmaker had wanted it. The process, which took more than a full year to complete, is instantly recognizable from the start of The Godfather with enhanced picture and sound, offering lovers of the films born before the first two were released (especially those like myself who consider Part I to be the greatest cinematic achievement of all time) the closest reproduction of what it must have been like to see it onscreen back in 1972. 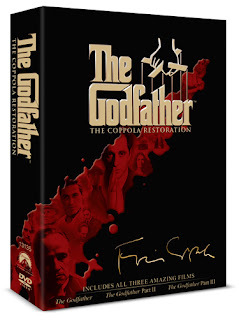 Including all of the special features available on the previous set along with Coppola’s fascinating commentary on each film, The Coppola Restoration adds an even greater plethora of extras for us to peruse in this five disc feast of a collection with an entire extra disc of added features, documentaries, and short films. Ultimately, all it seems that’s missing from the set is the cannoli. One of the most fascinating things about revisiting the series time and time again is the way that one’s reaction to it changes over time. With my initial introduction, I was completely in awe-- literally jumping in my seat when the studio boss awoke to finding a horse’s head in bed with him after Tom Hagen (Robert Duvall) flew out to make him an offer he couldn’t refuse in hiring Vito’s godson, Johnny Fontane (rumored to be inspired by Frank Sinatra). Upon a second viewing, the characterization and arc of the main roles, most notably Al Pacino’s tour-de-force portrayal of Michael Corleone left me completely riveted. Beginning the film as a shy, patriotic World War II decorated soldier with his beautiful girlfriend Kay (Diane Keaton) in tow—it seemed like all Michael wanted was a life that was the polar opposite of his father’s mafia-driven one. After an attempt is made on his father’s life and they realize that a traitor remains in the family, it isn’t the hot-tempered, womanizing yet exceedingly loyal eldest brother Santino “Sonny” Corleone (James Caan) or the sweet, pushed around but lovable middle son Fredo (John Cazale) who enacts revenge but Michael, taking out a powerful gangster and a corrupt policeman in one of the most famous scenes in the entire series. After hiding in Sicily, his life is forever altered and upon his return to America, we see a changed Michael who grows far more calculating and manipulative as the series goes on, putting business before family (although claiming the opposite is true), which ultimately leads to driving away all those who were closest to him. In the second film, Michael’s continual rise to power and his decisions which alienate everyone nearest to him are intercut with the history of the Corleone family and Vito’s goal to make something of his life for his family in the U.S. In doing so, we follow the young boy in turn of the century Corleone, Italy to his arrival in America where as a mature man trying to make a living he’s played by Oscar winner Robert De Niro. In one of De Niro’s finest roles—largely acted in Italian and one that defies impersonation of Brando—he adds a depth to Vito that we hadn’t realized and the themes from his story as well as Michael’s in the fifties overlap into an ending that contains less bloodshed but manages to hit viewers even harder than the baptismal murder scene and ultimate promotion of Michael as the Don which occurred near the end of Part I. And, although one can argue that the first film is more mafia-centric, those who try to dismiss the entire series as such are left with little doubt that it’s truly a family epic by a breathtakingly beautiful and heartbreaking scene near the end of II after the death of Fredo when Michael recalls (in flashback) a nostalgic memory that had sort of set the stage for his decision to cut himself off or act independently, as he’s the last one left in the frame and we realize how many of the characters onscreen are now dead. While the third film was perhaps misguided and much ink has been spilled about the awkward portrayal by Francis Ford Coppola’s daughter Sofia Coppola as Michael and Kay’s daughter Mary Corleone (who had played the baby “boy” being baptized in I) along with an over-the-top plot concerning the Vatican in Rome as Michael tries to make the business go entirely legitimate, it’s still an engrossing entry that manages to provide closure and a horrible yet inevitable conclusion to this chapter of Michael’s life. Yet, this time around, Part III became a bit more fascinating to me and not just for the introduction of two great characters played by Andy Garcia and Joe Mantegna but especially because Coppola gave his sister Talia Shire who played Michael’s sister Connie, one of the most intriguing roles in the film. Although she’s portrayed as helpless in the first movie as she must contend with an absolute brute of a husband and events are set into motion that make her appear like a Vegas styled floozy in the first half of II, a change begins occurring near the end of the second one after the death of her mother makes Connie the Corleone matriarch. In the third film, although Michael is ready to make amends for his sins and put his past deeds behind him, it is Connie who becomes a sort of unofficial Don, helping to establish order in a way that leads to a phenomenal chain of events. As a grown woman watching this series again, I’m always amazed to catch something different with each viewing whether it’s the abundance of oranges that precede a death, a fish shown outside before Luca Brasi sleeps with the fishes, framing and shot selections as Michael tells Fredo “you’re nothing to me” in Part II etc. Yet this time, right from the start (and possibly because she and Michael are the only ones to make it through all three films as we lose Sonny, Fredo, and Tom), I was utterly drawn in by Shire’s quietly poignant and exceptional portrayal and the way that she—like Michael-- evolves just as much although she’s given far less screen time. While there’s much more to note about the incredible series and it’s basically all been said before either in documentaries or by scholars, professors, fans, and filmgoers, there’s no denying that a film that continues to provoke this much stimulating discussion is truly an American treasure and The Coppola Restoration isn’t just a treat for fans of the series but a must-own as well as simply a vital part of American history as it’s become literally part of our culture in a way that other films have not. A word to the wise, however-- just don’t over-simplify and ever call this a mob movie to an Italian or I’ll have to make you an offer you can’t refuse, which is to watch the series again and this time pay much closer attention to the story that is really being told.